It can actually be EASY to get healthy on a budget, but with so many excuses available with why we aren’t fit, not having enough money being one of them, it can be easy to fall into the rut of blaming being overweight or unhealthy on not having enough money to do so. Also with fast food being so easy to get, you can really start relying on these large food chains to provide the bulk of your diet, which are unhealthy calorie packed disasters that can lead to one being out of shape and unhealthy. But there are great ways to get healthy on a budget that can turn out to be a lot cheaper than going out or buying foods that aren’t helping you attain your health goals. Below we have compiled a list of ways that you can utilize on in your daily routine that can help you get your health in check and do so on a budget! Tip #1 WHY do you want to do this? First off to get healthy on a budget, you have to be crystal clear on WHY you want to do so. Is it because you want to look better and save money for a vacation? Save money for retirement? Or just tired of realizing how much money you are spending on eating out each month, and realizing its downright depressing! Whichever your reason is, getting clear on your why you want to do so will help you create a goal around it and make your more likely to accomplish it. Buying food in bulk is an awesome way to eat healthy cheaper. You can even get a friend to go shop with you so you don’t have to worry about the things you are buying going bad, and split the cost. Tip #3 Eggs are your new best friends! Eggs are cheap as heck and are incredibly good for you. You can use eggs for so many different meals, some being; egg frittata, omelets, scrambled eggs, egg burritos, fried rice with eggs, etc. Becoming a healthy budget shopper. Act like you are in college and are living that penny-pinching life! Look for coupons in the Sunday paper, get the 5 for $5 or the buy one get one frees. Utilize the sales for what they are worth. You can also look online and print coupons out before going to the grocery store. Grocery stores also mark down items that are going to expire soon; sometimes it can be more than half the original price. You can either search for these deals while in the store, or call ahead and ask when your local grocery store puts on these food clearance deals. Meal preparation is a tool used by a lot of the biggest body builders and health nuts out there. It is a way not only to prepare healthy food a couple days worth of eating, its also a way to keep you accountable as well as keep you from buying fast food as the food is already prepared and ready to be consumed in your refrigerator! When we are super hungry we look for simple and fast alternatives to curve that screaming hunger pang. The best thing to do is to not get to this point, which you can do by having a piece of fruit of a bag of nuts to eat, allowing you to curve your appetite long enough to eat some of your pre-prepared food. This way you don’t waste your money on empty calories provided from fast food. Now I’m not trying to reiterate what your parents were preaching to you years ago, but honestly vegetables can be cheap to buy and provide great bulk to your diet providing you satiety as well as keep you from overeating. You can also plant your own garden if you have the space. This will allow you to fresh veggies at the price it takes to buy the seeds and the water you use to keep them alive! 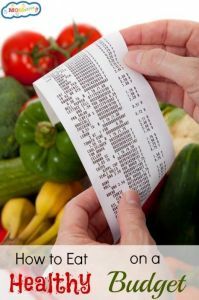 If these tips don’t make you believe that you can consume a healthy diet on a reasonable monthly budget, then check out a documentary called Food Stamped. This documentary is made by Shira and Yoav Potash, which their goal was to show you how you can eat healthy organic food on a food stamps budget! This documentary is great and Shira and Yoav are very likable, making it worth the watch! Using these tools can help you get healthy on a budget but don’t go all out at first. Still eat things that keep you sane, treats and sweets, but do them more sparingly and get them on sale or with a coupon! Also eating healthy has to be looked at as an investment, which can cause motivation to stay away from foods that cause you to be unhealthy. Eating healthy may seem tough at first but you can both save money now as well as save money later as you are going to keep yourself from becoming sick or getting disorders and diseases that come with living an unhealthy lifestyle. In today’s day and age, we are all doing things FAST! We have this same mentality when it comes to eating. If we can just slow down our eating habits and chew more, preferably 40 bites per swallow, we would eat less as it would give our minds and bodies time to realize we are full. Eating less means spending less on food as well as losing weight if that is your goal. Now you have 10 tools to use to get healthy on a budget and stay that way! If you have any other tips on the subject feel free to leave them below!! Thanks guys! How To Deadlift More Weight To Hit BIG PR’s!